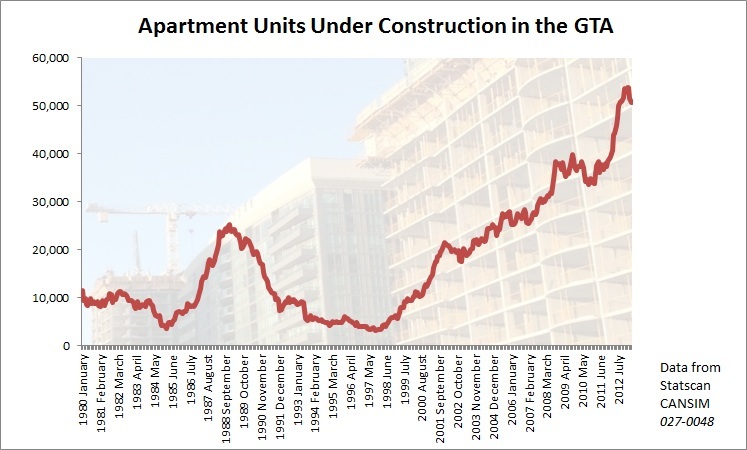 After a quick drive on the Gardiner it may appear that Toronto's condo market is booming. Dozens of new towers line both sides of the highway. Over 70 cranes are parked sky high in the downtown core. More than 200 new buildings have been proposed in the GTA. But dig a little deeper and you will find some worrying signs of the upcoming bust. New condo sales are in a slump. Housing starts are down. Prices have been stagnating since early 2011. Yet all of that seems to be masked by 51,365 apartments under construction in Toronto that were pre-sold years ago. According to Skyscraper forum there are 148 towers under construction in the City of Toronto. Seven in Mississauga, 11 in Markham and many more in other cities in the GTA. 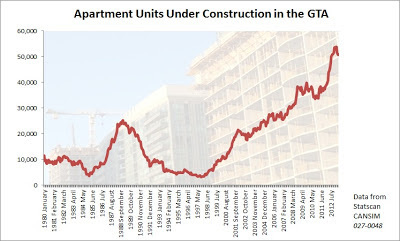 In fact, by some estimates there are around 250 condo towers under construction in the GTA. The picture below pinpoints all of the towers under construction in the City of Toronto. 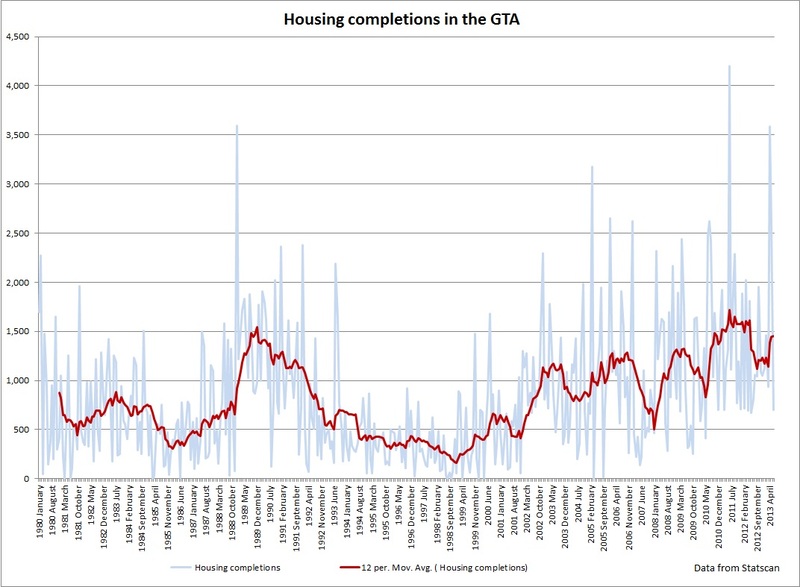 Notice how most of the projects are concentrated in the downtown core - the epicenter of Toronto's condo bubble. 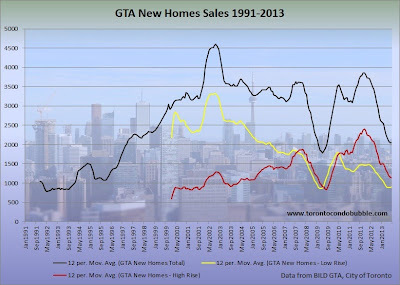 Across the GTA, total new home sales were down 21% in July 2013 compared to July 2012, and they're currently running 40% below the 10 year average. Specifically, high rise sales were down by 29% from a year earlier and down 34% from a 10 year average. Low rise sales were down by 7%, and now running 45% below the 10 year average. 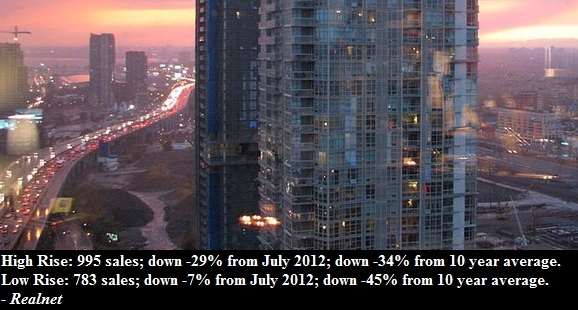 New condo sales in the City of Toronto were down over 17% this past July from a year earlier. Sales were down by 32% from July, 2010. 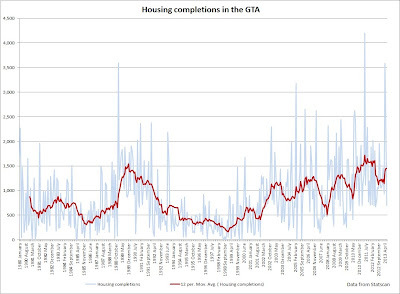 Housing completions in the GTA are up 4% in June 2013 compared to a year earlier. As the new towers edge closer towards completion I expect a new record in housing completions. 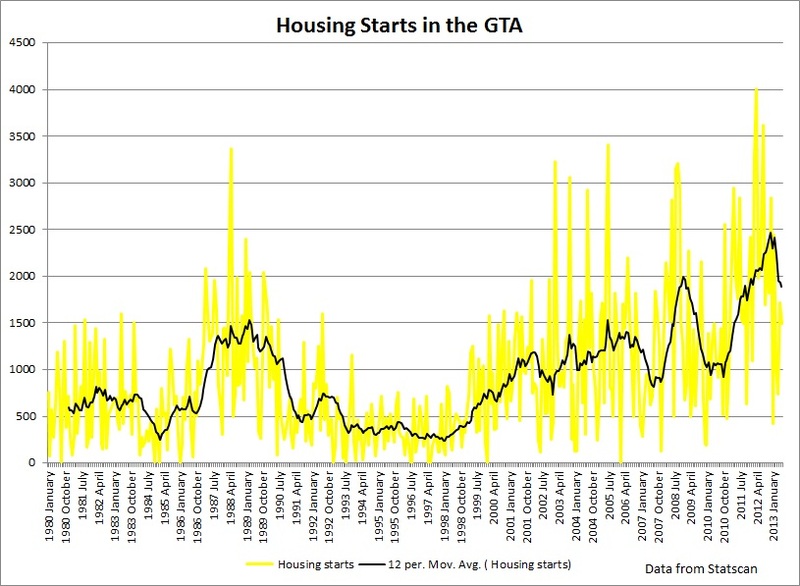 Housing starts in Toronto are down over 28% in June, 2013 compared to a year earlier. 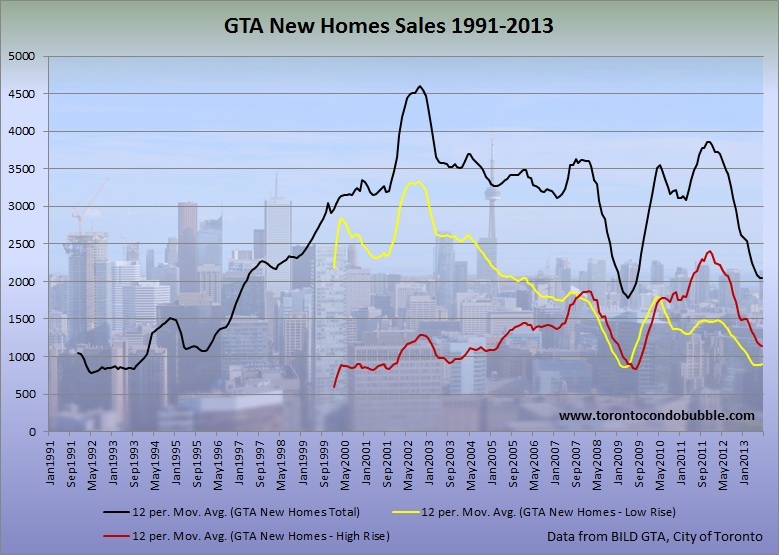 On a quarterly basis, Toronto's multiples starts are down over 42% in Q2 2013, from Q2 2013. Finally, while the new low rise price index hit a new record high of $645,854, the new high rise prices have been stagnating for the past two years. In fact, if you adjust for inflation, new condo prices have been falling since 2011. But when will we start seeing more dramatic price declines? Sooner rather than later. 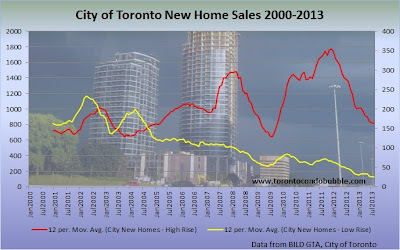 Will we see price declines in new low rise units? I think so! What do you think?